I just read, “choose an identity” as I posted a comment on someone’s blog, and I thought…Hmm. I remember when I would do that– and could do that quite well. But not anymore! I used to be able to tailor make myself to be something for others. Which identity do I put on today? Good girl? Worldly girl? Fun girl? Likes to drive fast girl? Shy girl? Perhaps it was the theatrical side of me or perhaps it was discontent, I do not know. But now I am just me. Now I am exactly what you see. Jesus has made a world of difference in my life. Over the past couple of days, I have had the privilege of meeting with a few new and old friends–some who are bloggers. Let me tell you, every single person I have ever met through this world o’ blog has been exactly, who they portrayed themselves to be. Of course, there are tons of details we leave out in our posts for the sake of privacy, but every single “identity” that I had read was exactly that identity in person. And each of them loves the LORD as much as they say they do! Today, Trish had come to Colorado from Arkansas for some family time. So Meredith, Joanne and I met up with Trish in Castle Rock for a good visit. Trish is the sweetest and most caring kind of friend. She made each of us a beautiful scarf–and for our daughters, as well (Sydney got a beautiful pink hat–here she has put her hat on all by herself! Oh, and Tabor is quite fashionable in my beautiful dark green scarf!). Trish told me she stitched them in prayer–well I may just sleep with it wrapped around me. I love to be literally wrapped in prayer, don’t you? I was blessed by Trish’s wisdom in raising her children. She has 3 children (all teenagers) and is about to be a grandmother! That grandbaby is blessed already by her Nana and is treasured and loved greatly. I cannot wait to see this baby girl’s picture! Her story is the most precious and beautiful picture of Christ I have seen, yet. It gives me goose bumps just thinking about God’s blessings! Joanne, Mer, Trish and I sat and visited like old friends. We laughed and listened and loved being together with friends. We could have talked all day and night. It was a lovely picture of sharing our lives together. As Joanne said tonight, it was like a taste of Heaven. Can you imagine the times of sharing to spend there without a worry or care?? Joanne blessed each of us with a beautiful notepad, which she stitched with love. She also bought my coffee this morning! It took me about 2 hours to realize I had not paid for my coffee at the coffee shop we stopped at first. When I realized it, I said, “Joanne, did you buy my coffee this morning?” Well she did! And I’m so thankful to her and so glad that I didn’t leave a place providing a treasure of coffee and NOT pay for it! How wonderful to have a friend like Joanne, who simply is a blessing. Meredith drove me today, and we had a wonderful visit both directions. She is a sweet and caring, tenderhearted friend. I think in many ways, God has given a friend to me like Meredith, to show me the way to do this thing of life. She is wise and truly a balm to my weary heart in this journey of joblessness. I have to tell you–lately God has been sending blessings in the form of His people all over the place for me. I feel FULL–of joy and thankfulness and gratitude. It makes me wants to sit in the middle of the floor and cry for no real reason. There’s another thing I have been feeling lately–like changes are coming and happening all around me. Friends, even though there is a forecast of snow this Sunday, I DO believe SPRING IS COMING! I do indeed! Loved this! Yes, I have been blessed by nothing but “real people” lately — even those I have never met face to face! It seems to be God’s theme of late — authenticity…getting away from posing. I told my husband two nights ago that I was tired of “posers” in the Body of Christ. Now, I don’t say that in judgement because I have done my fair share of posing in the past. How nice, to be blessed with “face time” with your friends! So thankful for the time spent with you yesterday! I’m praying for you today…and I just sent you an email! Great post. So true. I used to be one of those gals who tried to be what everyone wanted me to be instead of just being me (it was so exhausting!). I am much happier being me! I’ve found the same thing in all of my meetings with online friends. 🙂 What a blessing! I so wish I could come and join your knitting circle! What fun! Thanks for stopping by and leaving sweet words. 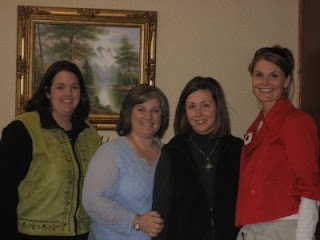 Looks like you had a beautiful day with some sisters.And good fellowship should be snatched up when it is available. What a neat blessing for you. A little hug by God. I think I have commented before on your blog. We keep running in the same Siesta Bloggy Circles 🙂 I so enjoy your comments on other blogs (Bev thinks you great..so that says something to me :), and some of your posts that I have read. I so get your identity crisis thing.. It is so freeing to not have to be anyone other than who you are.. I struggle at times, but I know that I need only to care what Jesus thinks of me. Hi again, Holly – I just wrote a post that I’d love your input on. It’s sort of regarding how I’m doing with the BG study.